If you have read previous Anecdotes and Adventures you would have noted that we are in Cape Town and we rather enjoy riding around the southern peninsula when possible. Popular lodgings website Air B and B not only provide a varying range of quality homes they now also allow locals to offer Experiences to the tourist making local talent accessible to all. Like the homes, these experiences can vary but are all vetted by Air Band B and are subject to their rules and regs therefore all are legitimate. 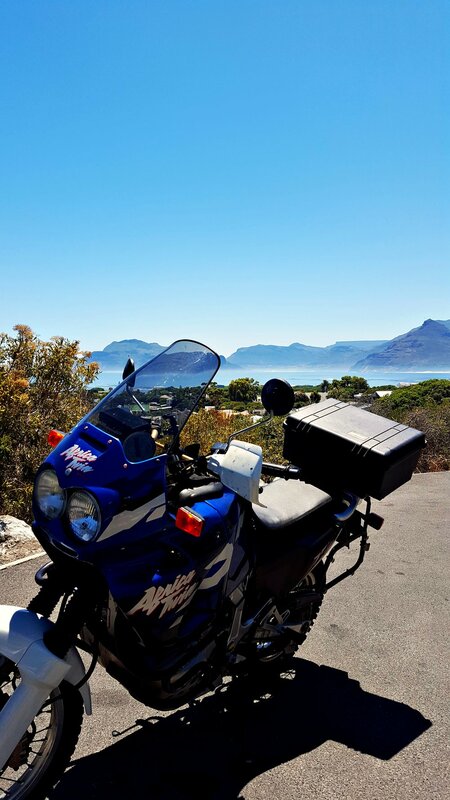 Hidden among the swathes of culinary and hiking experiences found in Cape Town there is an advert offering to Explore the Cape on a Motorcycle with a local, what more encouragement does one need ? A few clicks later and we are booked, very simple. We are instructed to turn up to Andrews bike shed at 9:30am to start the tour which we do thanks to Cape Towns burgeoning use of Uber. A warm welcome from Andrew and we go over the rides for the day, all Africa Twins that Andrew has bought, stripped down and prepared himself, no hidden surprises when out touring on these machines. 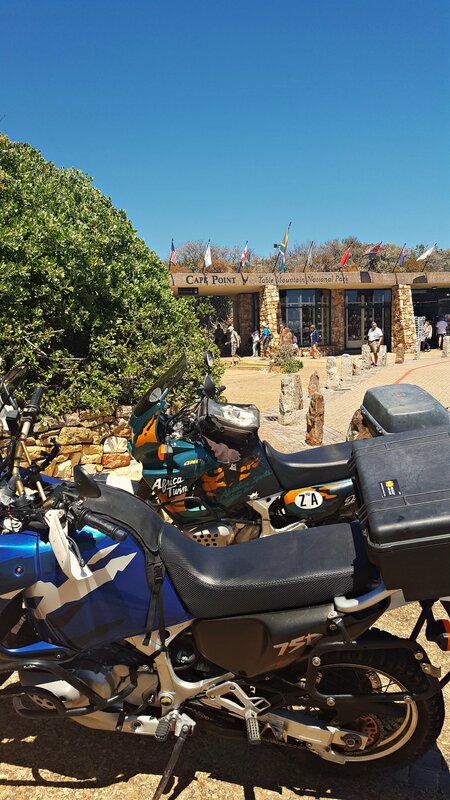 It's no surprise to hear that he is also a qualified and registered adventure motorcycle guide with over ten years experience in leading motorcycle trips around Southern Africa. So by all accounts todays five hour ride around the southern cape is a dip in the ocean, figuratively of course. Coffee sunk and its time to hit the road. The Africa Twin soon comforts you in to trusting it to take care of things and it becomes very docile to ride, no need to muscle and hustle. Winding our way up the Constantia nek road we head to Hout Bay, Chapmans Peak Drive, the west coast road down to Cape Point for lunch, around the tip and then return up towards Cape Town around False Bay. Approaching Hout Bay, whilst chatting over the comms we decide to head over to the Victoria Road for a look back at Camps Bay and Robben Island. This is the Victoria road and is a must if you are in the area, Winding around the cliff face its as wide as a football pitch and smooth as a snooker table. Views digested we head towards Chapmans peak, stopping off before the pass starts for refreshments. Andrews engaging history lesson starts here with the interesting story of the bay and the peak. Back on the bikes Chapmans Peak drive rarely disappoints. This time just as good, although the other direction is better (discuss). Over and down and through the bottle neck of Sun Valley we head to surf and yoga central otherwise known as Kommetjie. A cheeky photo op here looking back over the two bays with Chapmans Peak in the middle. The scenery on this tour is second to none. With all the tours Andrew offers through his longer adventure tour company Ride Down South, this is without doubt one of the best value tours for scenery per miles. The stunning ride down to the point is breathtaking, which is more than can be said for the chicken baguette from the cafe, still, today is not about food. Post chinwag about bikes, touring and all things life on 2 wheels we head back out and explore the park a bit more. In particular a great looking beach called Platboom Beach. Andrew continues to supply facts on Cape Point and now turns his talent to game ranger. With his trained eye he points out the indigenous animals a mortal tourist would no doubt miss. We continue round the tip of the peninsula and start to head north towards Simons Town. Quick detour on the switchbacks of Red Hill pass we pull over next to a WW2 gun placement and talk about the history of the country. These experiences are turning out to be very good indeed and this one is second to none. To ride bikes, in stunning scenery and listen to a local passionately speak about the area and the country, it cannot be beaten. We head over Boyes Drive with the amazing vista of Muizenburg beach below us and complete the ride back to Andrews Bike Shed. Now off the coast you can feel the late afternoon heat and we are glad to get back, take off the riding gear and sink an ice cold beer. Days like this do not often come about and I leave with the experience of riding an Africa Twin around the iconic peninsula of its namesake continent, all the facts and history served up by Andrew and to meet another member of the global moto family. Biking at its best. You can find the experience on Air B and B. Type in Cape Town as your destination and click on experiences (do this wherever you are). Also you can find Andrew and his tour company here Ride Down South, on insta @ridedownsouth and facebook as Ride Down South. Be tempted by one of the amazing looking adventures. If you are in Cape Town for a holiday, take the day tour. YOU DONT NEED TO BE ABLE TO RIDE A BIKE as Andrew will take you on the back. Alternatively if you are looking for an adventure of a lifetime, take on a larger tour. You will not be disappointed, Andrews personable, reliable and easy going management make the experience all the more enjoyable and relaxed.